On Thursday February 1, Indian Finance Minister presented his fifth straight Union budget. And as was hoped, he did talk about cryptocurrencies. 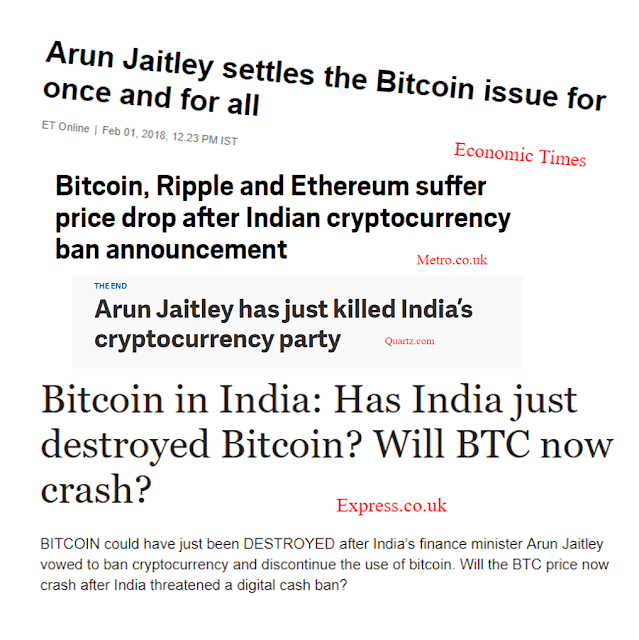 What happened next was mainstream media started flagging Bitcoin as illegal in India now. But is that really true? Is Bitcoin illegal in India now? Has the government banned Bitcoin trading? Arun Jaitley on Bitcoin: What EXACTLY did he say? “The government does not recognize cryptocurrency as legal tender or coin and will take all measures to eliminate the use of these crypto-assets in financing illegitimate activities or as part of the payments system,” said Arun Jaitley in his 2018 budget speech. Mr. Jaitley also suggested that the government will take measures to explore the application of Blockchain technology in the financial sector. Blockchain technology is the same underlying tech behind Bitcoin. Did he Say Cryptocurrencies are “Illegal”? 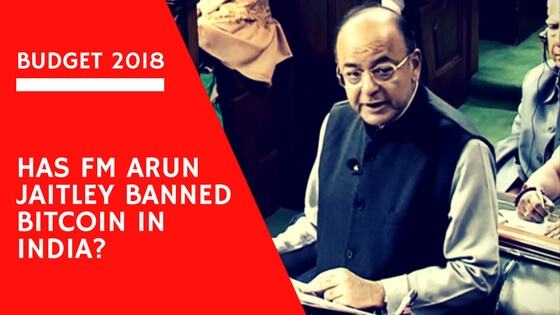 In his entire budget speech, Finance Minister Arun Jaitley nowhere mentioned that cryptocurrencies are “illegal” and that the government is banning them. What Mr. Jaitley said was something he has been saying for quite some time now. Only now the difference is he had much of spotlight this time with possibly the entire world listening to him carefully. 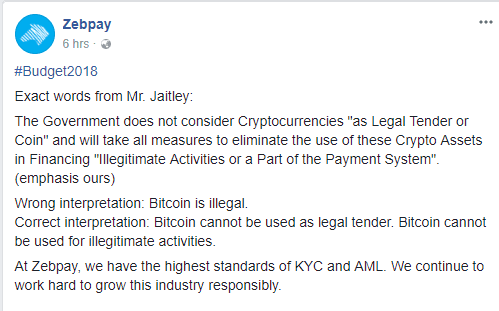 Again, Mr. Jaitley reiterated that cryptocurrencies are not a legal tender or coin. This still leaves the cryptocurrency market well unregulated, as it has been all these years. So, have you been getting carried away with all the mainstream news websites claiming that Bitcoin (and other cryptocurrencies) are now illegal, RELAX! Bitcoin is NOT ILLEGAL. This means you’re still open to buy and sell this digital currency freely. What Will Indian Government Do Now? 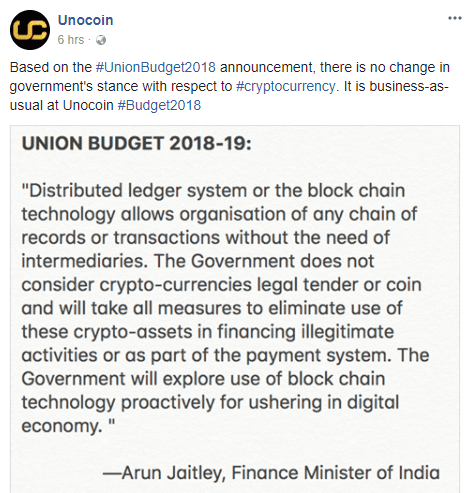 Well, in immediate future it’s very likely that Indian government won’t take any step to deal with the cryptocurrency market. A year back, the government set a committee to know how to better deal with the likes of Bitcoin. The report from the committee is still due. So until that report comes, there won’t be any definite action taken in this direction. Mr. Jaitley did say that the authorities will attempt to eliminate the usage of crypto-assets in financing illegitimate activities. It is something that governments around the world have been trying for to do—including those who have legalized the trading of this digital currency. Indian government can regulate the cryptocurrency market, charging high taxes from the traders and investors on their returns. Indian government can make cryptocurrency trading and holding illegal-- penalizing individuals and agencies who get involved in this activity. There’s a very high chance the government will go for the first option—regulate Bitcoins, and other Cryptocurrencies. Keeping away all the speculations, as it stands right now, Bitcoin is NOT banned in India. You can freely buy and sell this, as well as any other Cryptocurrency. What are Indian Bitcoin Exchanges saying? 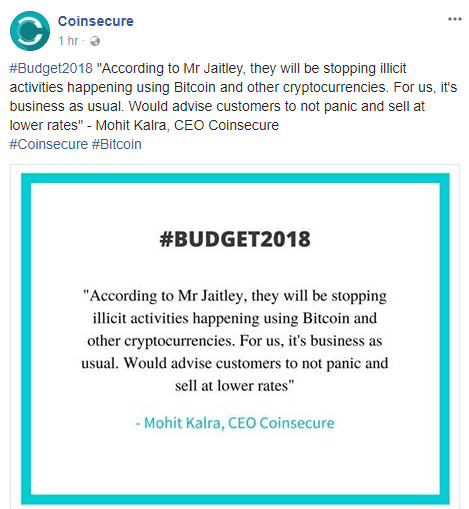 Some of the leading Bitcoin exchanges in India have come ahead to comment on Arun Jaitley Bitcoin / Cryptocurrency remark is his budget speech. All of them have taken this neutrally, and in fact positively. Also, the Blockchain And Cryptocurrency Committee (BACC) of the internet and Mobile Association of India (IAMAI) has released a statement saying they are happy that Finance Ministry has recognized the importance of Cryptocurrencies, and that they are “neutral-to-positive” about the statement made by FM Arun Jaitley. They also took a jibe at mainstream media for misinterpreting and misreporting the words of Mr. Jaitley. Here’s another video of Arun Jaitley, right after the budget speech, in one of his interviews to new channels. Nowhere has he said Bitcoin is illegal or is banned in India. If you’re a Bitcoin investor or trader, shut down the noise of all the misreporting news platforms. Unless you’re hearing government officials say or release a statement saying that Bitcoin is illegal, you’re free to buy and sell it. Bitcoin is NOT Illegal in India. Bitcoin is NOT banned in India.